Nobody wants to think about it, but the current​ MLB CBA expires on December 1, 2021. That's not far away, and with the poor relationship between MLB and the MLBPA, it's not out of the question that there's a labor stoppage around the corner. ​This is especially true if players continue to get shafted with short-term deals in free agency, and some of the best young players don't get what they're worth in arbitration. 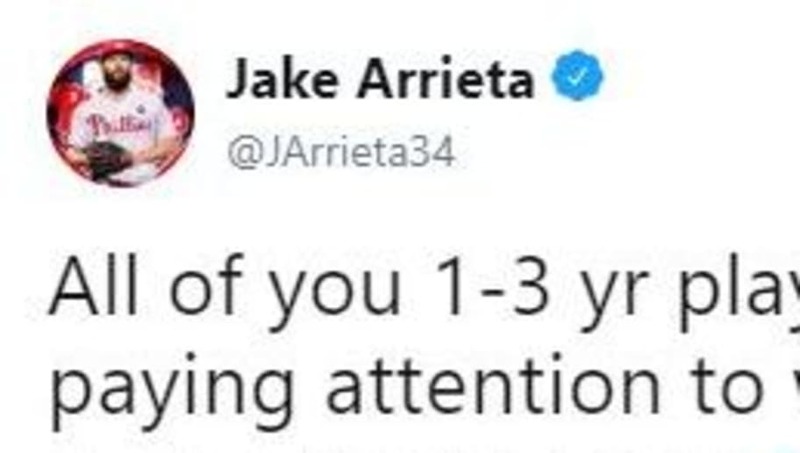 Philadelphia Phillies ace and former NL Cy Young Award winner ​Jake Arrieta wants to remind everyone of this fact, sending a pointed tweet this morning. Arrieta is an established veteran and doesn't mind voicing his opinion on any topic he finds important. He wants to remind the young players in the game--which at the moment are the best in the sport--that what's going on is unacceptable. MLB owners aren't willing to pay players age 30 and older the big dollars, which you can understand given the track record of guys once they are out of their prime. So why aren't the young guys entering arbitration, who are the best on their teams, no getting paid? ​And when you consider just how much money the leag​ue made this past year compared with the fraction of that money that the players are seeing, a strike seems almost inevitable. These issues could very well be a bone of contention once the CBA negotiations role around, and it might take a strike to change things for the better.